The roof works have been ticking away up out of sight. 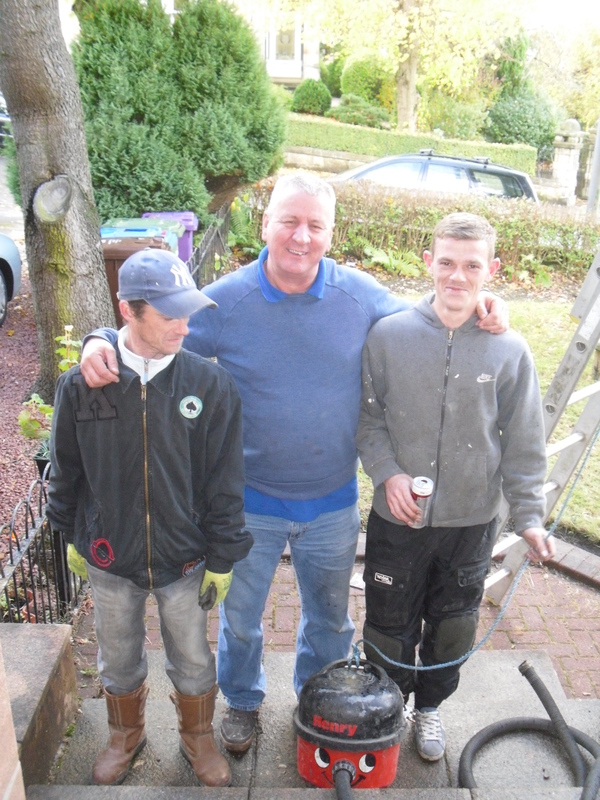 As we discussed our roofer Charlie felt that the roof didn’t need to be fully replaced – but could be repaired. Another factor that encouraged us to work with what we have got is the adjacent house that we are attached to i.e. 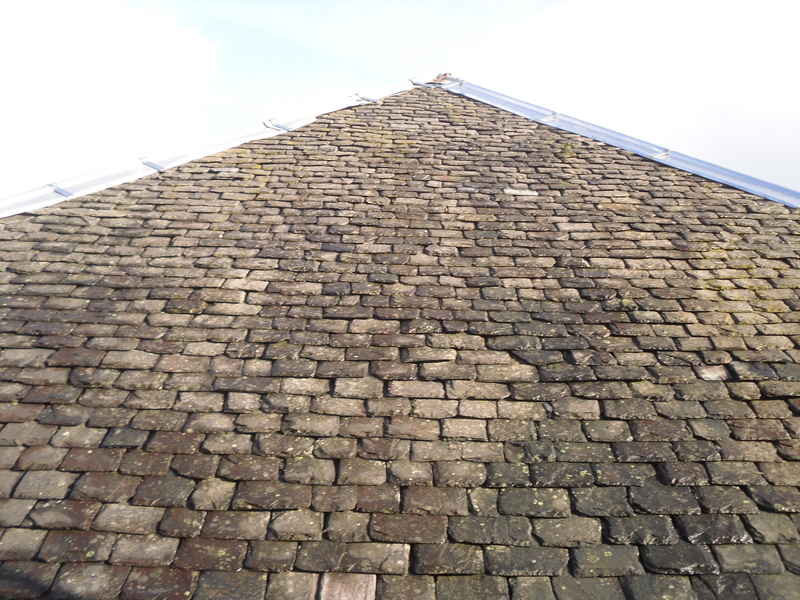 the other semi-detached property had its original roof. It works and it is in keeping with the neighbourhood which is good enough for us. I popped over to the site at lunchtime and was delighted to meet Charlie with his team Thomas and Pat. Pat was camera shy so after about four photos I decided to work with the photos I took – so my picture skills aren’t gracing the cover of any magazines. Notice little Henry the vaccum cleaner. He has a blue rope attached to him. This is because Charlie hoists him up to the roof top and actually vaccums out the gutters. He says it is a lot more efficient and gives a better end result. Hoovering a roof – whatever next? 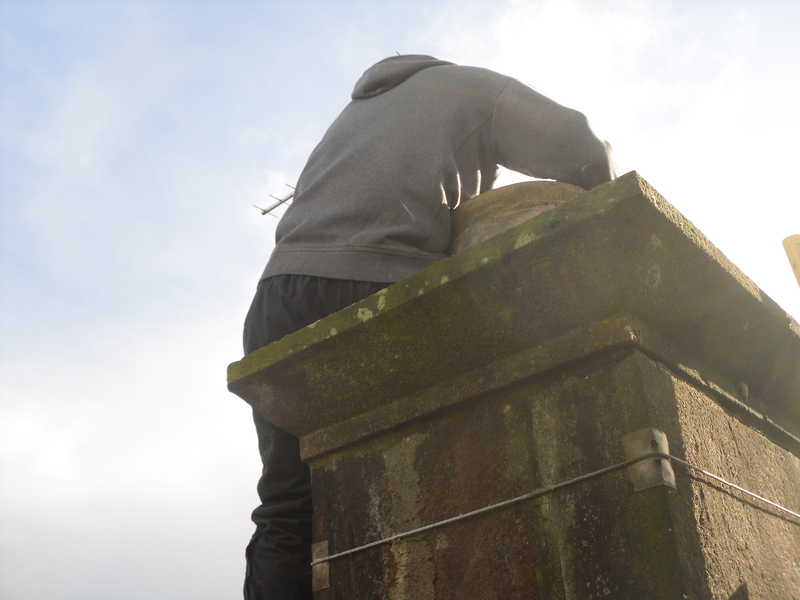 Now it was Thomas’ turn to be camera shy but I am reliably informed he was installing a chimney cap. The chimneys hadn’t been capped off properly which meant that when it rains (as it often does in Scotland) the rain would run down the chimney and course down the inside of the walls. As the fires hadn’t been lit for decades this was causing inevitably damp issues. This simple remedy will have those chimney’s dry in no time. This view is of the side of the house roof, above the double bay side windows where the scaffolding was erected. There were hundreds of tiles replaced on this side. 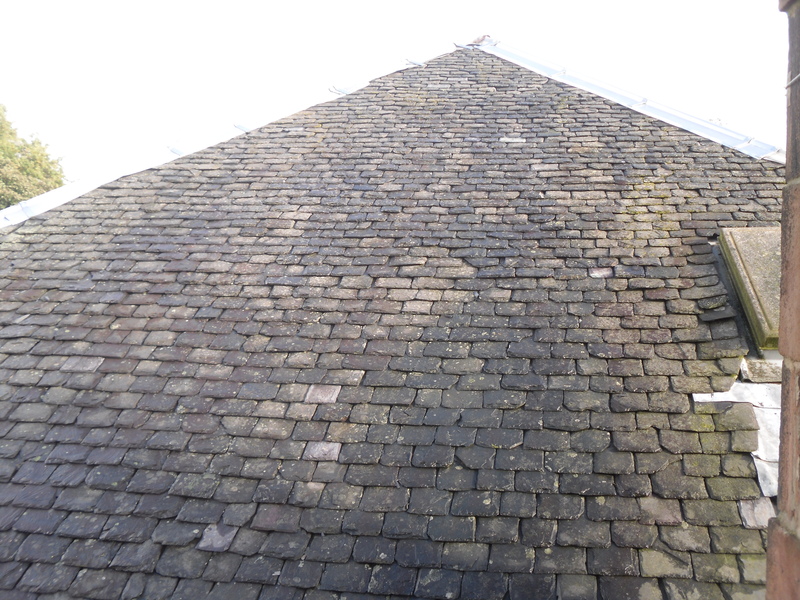 As the roof narrows to a point there was no where for other roofers to hang their ladders and so this side was neglected leading to the inevitable damage to the stonework at the side of the house. 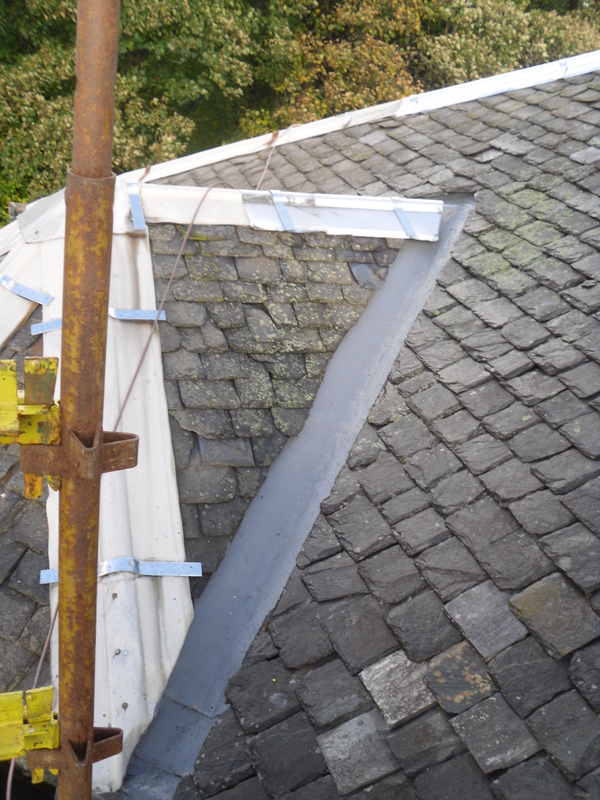 The last few pictures show the new flashings and the heavy duty brackets to hold them in place. 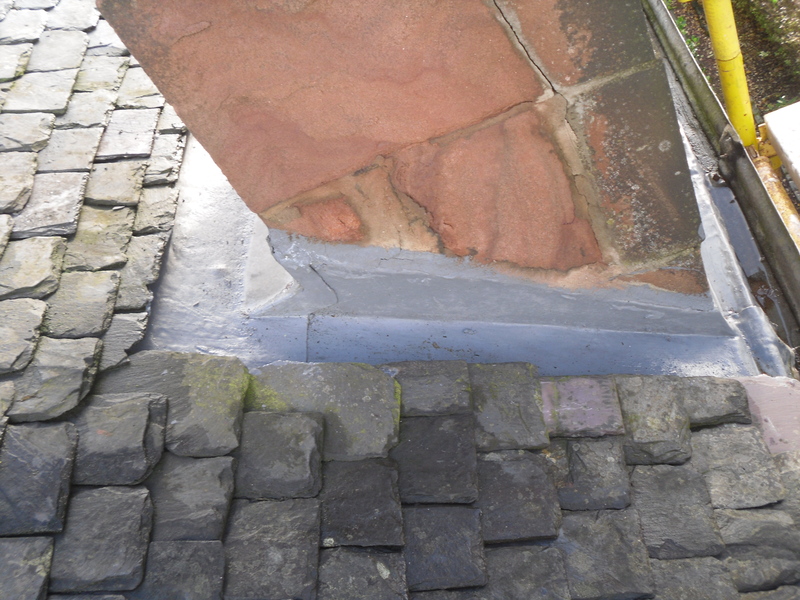 They have also re-sealed the edges of the chimneys. We now have a water tight house for which we are very thankful. This stage of the works should complete this week – just leaving the interior works to be done. We need to do this! It looks great and like the idea of keeping the original tiles. Poor Thomas – I share his shyness of cameras.